Our mission is to enrich the quality of life for students, faculty and staff by providing a broad range of recreation, wellness, and student engagement opportunities that complement the academic experience. "Non-UVU " is defined as any groups or individuals who are not state or federally funded or co-sponsored by a UVU organization or department. Non-profits groups can receive discounted fees, but must provide proof of non-profit status. Non-UVU events are assessed a rental fee and in some cases are required to provide proof of insurance or purchase insurance through the University before events will be scheduled. Event and location requests may be requested through the non-UVU event request form. These requests should be made at least 10 business days in advance of the event. UVU employees and UVU alumni can rent out a locker for 1 full academic year, and Student lockers are available to rent on a semester basis only. A valid SLWC Membership for the length of the locker rental will be necessary in order to rent a locker. 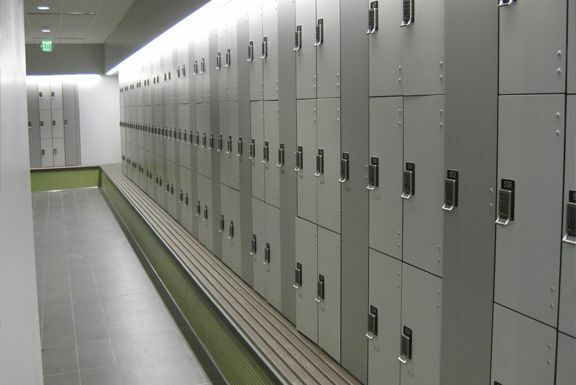 There are 162 half size lockers (for rental or select lockers are available for day use only for free) and 34 full size lockers (for rental only) in both the men's and women's locker rooms. In addition, there are 200 lockers throughout the SLWC that can be used for day use as well. For further information on how to rent a locker and on policy information click on the link below. Food is not permitted on the 3rd and 4th floors OR in the climbing wall floors of the SLWC. Only water bottles are permitted in these areas. 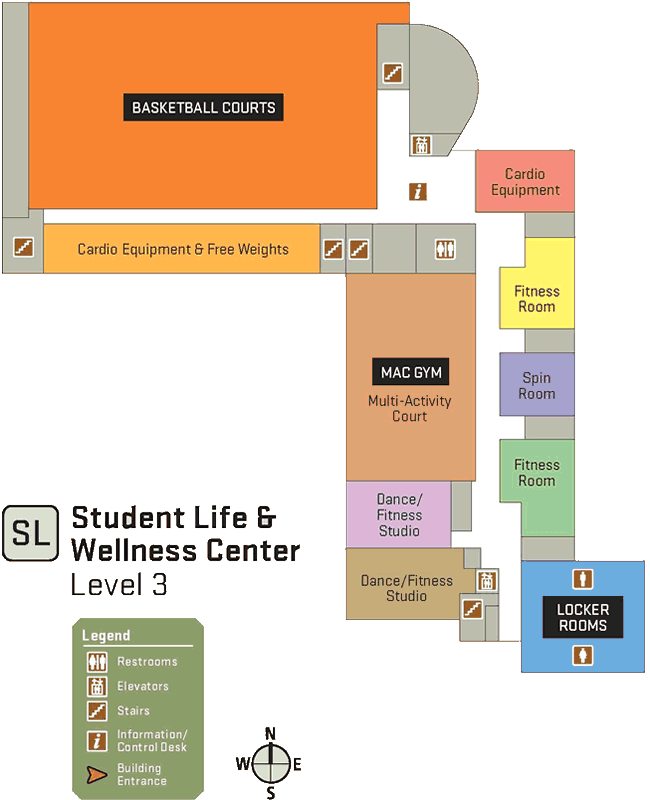 Programs scheduled by Campus Recreation & Wellness will have priority over drop-in and open recreation. If possible, part of the facility will remain open for drop-in participants. Use of alcohol, vaporizers, tobacco of any form, or other drugs is prohibited in the SLWC. The Center is not responsible for loss due to theft. Secure all valuables in a locker. Locks are to be supplied by the user. A lost and found is also located at the 2nd floor control desk. Skateboards, longboards scooters, hover boards and rollerblades are not allowed in the facility. No pets are permitted in the SLWC unless used specifically as a service animal. Only SLWC staff members may operate audio and video equipment. All Audio Devices must be plugged into headphones. Boom boxes are not permitted anywhere in the facility unless in conjunction with a special event. No filming is allowed in the facility without authorization from Director. All accidents and equipment damage must be reported to SLWC staff personnel or program supervisor immediately. An incident report must be filled out, put in the approved binder and a copy will be sent to the risk management director as well as the Campus Recreation & Wellness Director. Personal private contract work, i.e., personal training, and/or fitness workouts other than what SLWC provides, are not permitted at the SLWC. Anyone interested in receiving private instruction should contact the Campus Recreation & Wellness office. Exercises that cannot be performed in a safe and proper manner or may pose risk to others are prohibited. SLWC staff reserves the right to refuse admittance to facility or to request individuals to leave facility. Please avoid exercising in high foot-traffic areas, such as the carpeted areas and too closely to mirrors for safety purposes. Any loud or unusual sounds from members is prohibited. Failure to comply with posted policies and guidelines. Those who do not cooperate with established policies, use abusive language, are under the influence of drugs or alcohol or act inappropriately toward a University employee will be asked to leave and may have their privileges revoked. Providing false information to SLWC staff or forgery of any kind. Attempting to allow non-members to move through the gates in front of or right behind member. **Sneaking a friend into the facility that does not have a membership will result in a 2-week ban and further offences will result in a more extensive ban, as determined by staff. Failure to comply with requests from SLWC staff. Use, possession, or any distribution of alcohol, tobacco or any illegal substance. Violation of Federal or state criminal laws on University campus while participating in recreation activities. Suspension from SLWC facility and programs or revoked membership. The SLWC operates on an “exercise at your own risk” policy. The use of the SLWC facility and its programs is completely voluntary. Each individual utilizing the facility assumes the risk for any harm or injuries sustained. 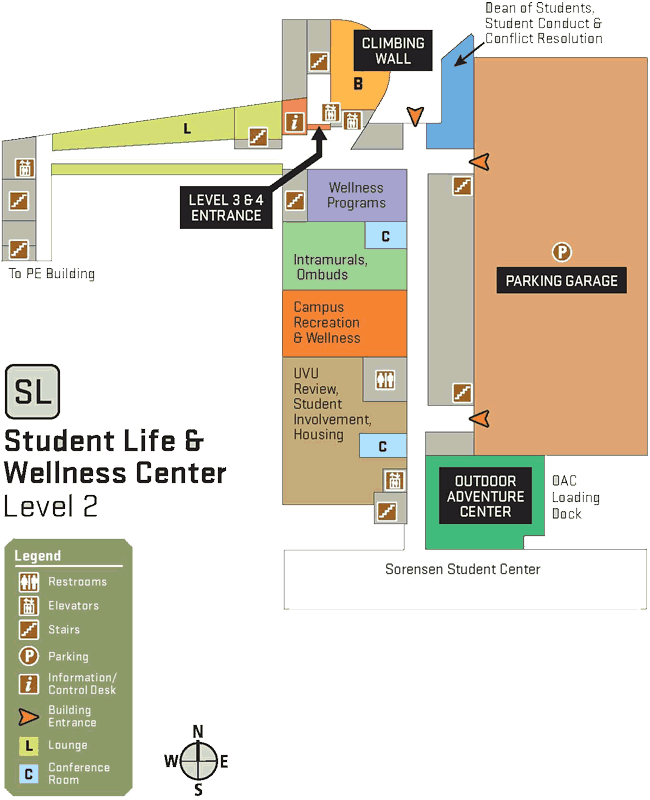 Neither Utah Valley University, nor the SLWC can assume any responsibilities for injuries incurred through participation in its programs and/or services in or outside the facility. It is strongly advised that participants use caution and be aware of potential health risks associated with exercise, and obtain a physical from a physician before beginning an exercise program. It is strongly recommended that every participant of the SLWC activities be covered by a health and accident insurance policy. Grabbing (hanging on) the rim or nets is prohibited. Do not move any equipment set up on the courts. Ask control desk for assistance with equipment setup or removal. Full-court basketball games will be broken into half-court games if participants are waiting to play. Please use caution when entering and exiting the track. Spectating from track is not allowed. Walk on the inside green lane. Run on the middle black lane. Pass on the outside green lane. Always look before passing or crossing a lane. The person in the green lane has the right of way. No strollers are allowed on the track. Stretching must be confined to the designated stretching areas. 13. Spitting of any kind will not be permitted on the track…please use garbage cans. A climbing wall supervisor must be present before participants may climb on the wall. Only UVU climbing wall & certified belayers & and wall supervisors can belay climbers. Use of personal gear must be approved by climbing wall staff. Proper climbing procedures must be followed at all times. UVU Campus Recreation & Wellness reserves the right to suspend any person for violating safety policies and rules or for any conduct that is viewed as unsafe or inappropriate. Only authorized personnel of SLWC are allowed to provide personal training services. Any participant observed or assumed to be personal training with a member in the facility who is not employed by SLWC specifically for that purpose, is subject to fines and/or suspension of SLWC privileges. For your safety, please do not leave personal belongings on strength and cardio equipment, or floor. Please use the lockers. Towels are required for personal and equipment hygiene. Please wipe down equipment after use. Do not operate equipment if it has loose or damaged parts. If machine fails to operate correctly, do not attempt to repair. Notify the control desk staff of any problems or contact them at 801-863- 5551. Keep hands and feet clear of moving parts while machine is in use. Place hands and feet only on the handgrips and footpads provided. Please use machines and equipment only for their intended purpose. Please return all plates, dumbbells and accessories to the proper rack or weight tree after each use. Standing on benches, equipment frames or base pads is not permitted. If someone is waiting to use the same workout equipment that you are using, be done with the equipment within 30 minutes. All users must remain at least 5 feet away from the mirrored walls during exercise. Please do not touch mirrors. Please turn treadmills completely off after use and return incline to 0. Any modification of equipment is prohibited. SHOES MUST BE WORN AT ALL TIMES! Equipment provided for different exercises (hand weights, slides, steps, etc.) may not be taken out of its designated area. Personal gym equipment (with the exception of wrist straps and gloves) are not allowed in the fitness rooms. The person checking out equipment is responsible for that equipment. If the equipment is not returned or is lost, stolen, or damaged, payment must be made per the assessed replacement cost. Further use of the center may be suspended and the person will be encumbered until payment of all bills is made. All areas, including the locker rooms, shall be vacated by closing time. Activity areas close 15 minutes prior to facility closing time. Announcements are made as closing time nears. A final announcement will be made when activity areas close. Participants are expected to finish their activity (15 minutes prior to closing), re-rack allweight equipment, return any checked-out equipment, finish showering and exit the facility prior to closing. Participants must stop participation within the SLWC during a power outage or University emergency. For extended power outages, the SLWC may be temporarily closed. A notice will be placed on the SLWC website (www.uvu.edu/slwc) and the main phone number (801-863-5551) with date/time of re-opening as soon as a decision is made by the SLWC. If the University is closed for the entire day, recreation facilities, including the SLWC, will be closed for the entire day. If the University has a delayed opening, recreation facilities, including the SLWC will have a delayed opening or will be closed for the entire day. If the University has an early closing, recreation facilities, including the SLWC will close early. If the University remains open (i.e. on the weekend or during the evening) but the weather becomes inclement and problematic, recreation facilities, including the SLWC, will close early or will remain open. Every attempt will be made to place a notice on the SLWC website (www.uvu.edu/slwc) and the main phone number (801-863- 5551). Participants who use the SLWC and/or equipment assume liability of and agree to compensate the SLWC for any damage other than normal wear and tear while it is being used. Facilities and/or equipment that require repair due to damage by users will be repaired and the user will be billed. If any rental equipment should be lost, the renter will be responsible for all replacement costs. All lockers are issued on a first come, first serve basis. All locks and lockers are the property of Student Life & Wellness Center. Lockers are to be used for legitimate recreational purposes only. Student Life & Wellness Center is not responsible for lost, stolen or damaged personal property or for items left in secured or unsecured lockers. All lockers are issued on a first come, first serve basis. Lockers are to be used for legitimate recreational purposes only. All half and full-size locker rentals must be cleaned out by the expiration dates listed below on the last week of the semester for students or items will be cleaned out. Locker clean out dates for faculty, staff and alumni will be on the last day of their locker expiration date, which is a year from the 1st day that they signed up for one. There are 153 additional lockers available for DAY USE ONLY in select areas along the walls of the Student Life & Wellness Center. Day use participants can use the lockers without a lock or put their own locks on them free of charge. Personal locks left on lockers overnight will be removed and contents of locker will be cleaned out and discarded in to the lost and found. Day use participants need to clean out their lockers by the end of the day. Lockers are to be used for legitimate recreational purposes only. We will have clean towels available for all SLWC participants. Locker reservations can be done at the Control Desk on the 2nd floor of the SLWC. All reservations must be done through the campus scheduling system 25 live. Candles, confetti, glitter, rice, straw and similar materials may not be used in the Student Life & Wellness Center. A clean up fee will be assessed for any violations of $20 per hour/per staff. All decorations, exhibits and displays must be removed immediately following the event. If the Student Life & Wellness Center staff has to remove materials left by your group, will be billed a fee of $20 per hour/per staff. The person, organization or group scheduling the room will be held financially responsible for any special clean-up, maintenance or repair resulting from the event or activity. 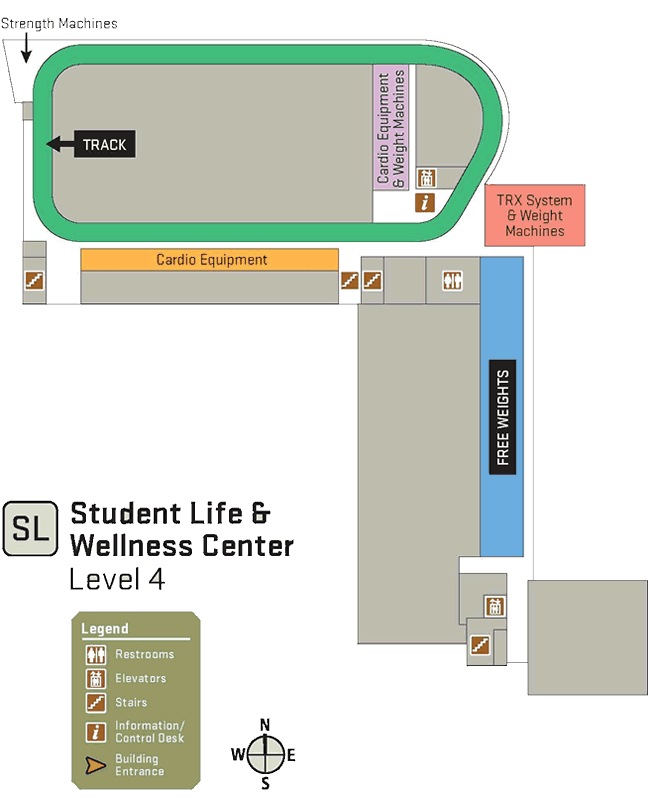 The Student Life and Wellness Center are not responsible for the loss or theft of items left in the building. If you reserve a room as a back-up, you will be charged one half the room rental fee. Anyone reserving the Plaza must have a back-up room reserved in case of inclement weather. You will be charged one half the room rental fee of whatever room you reserve. A $25.00 fee will be charged for less than 48 hours’ notice of cancellation or for not showing up for a reservation in any of the conference rooms. 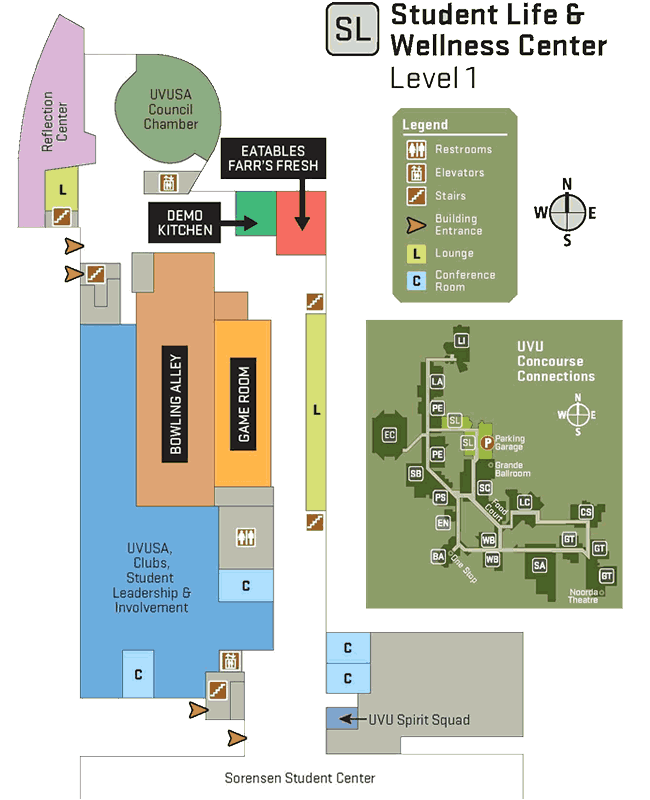 UVU Campus Signage Policy will be followed for campus advertising and promotion. https://www.uvu.edu/signage/. Banner space can be reserved through DaSheek Akwenye ext.6037. There are two locations for banners to be hung in the SLWC, the north and south railings above the 1 st floor student lounge. Participants are responsible for returning all equipment used during a class to the appropriate storage space. Patrons are not allowed to jump rope, lift weights, or stretch in the studios while fitness classes are in progress. The instructor reserves the right to ask a participant to leave should these policies not be followed. To ensure the safety of participants, class size may be limited at the discretion of the instructor. Only service animals are permitted within the Recreation Center. o The Americans with Disabilities Act defines service animals as any guide dog, service dog, or other animals individually trained to provide assistance to a person with a disability. Activity areas, entries/exits and the main lobby are subject to 24-hour surveillance. Live video is randomly monitored by Campus Recreation and the UVU Police Department. Campus Recreation & Wellness must receive a Waiver of Liability and Hold Harmless Agreement signed by each participant and/or parent/guardian. A comment/suggestions box is located online at www.uvu.edu/slwc. Simply go online and submit your comments/suggestions and or let an SLWC employee know of any way that we can better meet your needs. An elevator is located in the lobby next to the control services desk. If assistance is needed, please ask an SLWC staff member. Restricted areas for dependents less than 10 years of age (even if they are with a parent, grandparent or legal guardian).